Most of us think of meringues as pretty, sweet, ethereal affairs. Look at this picture. This is meringue as drama! The Meringue Girls, both the book and the two authors, offer a very vivid, colorful and flavorful look at the world of meringues. I will never think of meringues the same way again. Envisioned as a slab for any manner of fruit, sauce, nuts, praline, cream, ice cream – you can see how this will spark creativity. Also take a look at their Rainbow Cake and prepare to have your eyeballs tickled with delight. 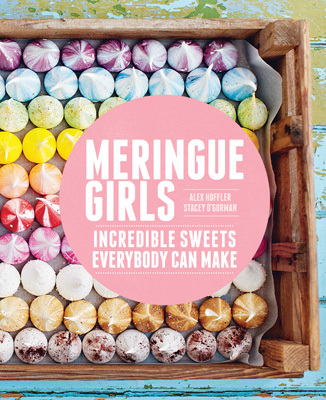 Excerpted with permission from Meringue Girls: Incredible Sweets Everybody Can Make by Alex Hoffler and Stacey O’Gorman, published by Chronicle Books, 2013. Photographs by David Loftus. 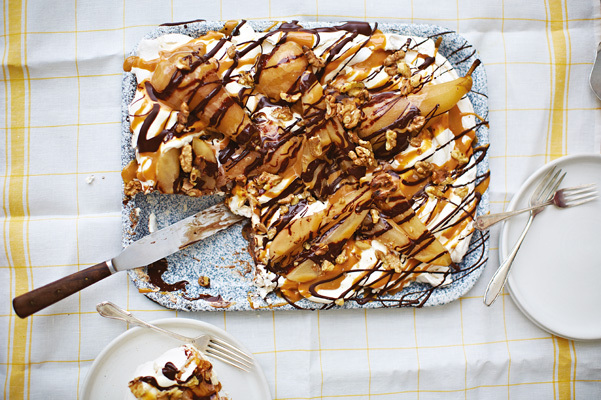 Oozy caramel, poached pears, dark chocolate, mascarpone, and walnuts— this is an autumnal dessert dream. 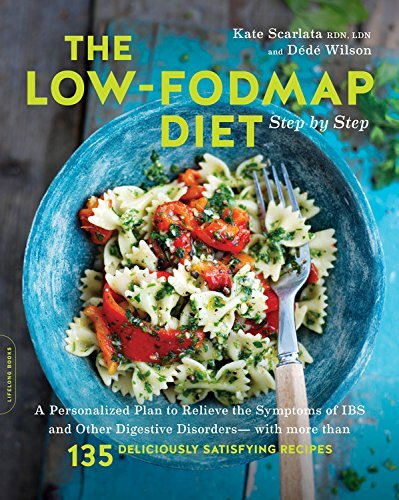 It’s a perfect finale to a casual dinner party where everyone can just dig in. To make the meringue base: Preheat your oven to 200°F. Dab a blob of meringue on each corner of a baking sheet, then line with parchment paper, using the meringue blobs to glue it down. Gently fold the cocoa powder into the meringue mixture, taking care not to lose any volume. Scrape the meringue onto the center of the prepared baking sheet and use the back of a large spoon to spread it into a rough 8½-by- 11-inch rectangle. To make the poached pears: In a medium, heavy-bottomed saucepan, bring the water to a boil over medium-high heat. Add the sugar and cinnamon stick and return to a boil, stirring to dissolve the sugar. While the liquid is heating, peel the pears, cut them length¬wise into quarters, and remove the cores; leave the stems on for visual effect, if you like. Carefully add the pears to the boiling liquid, turn down the heat to low, and poach gently for 15 minutes, or until the tip of a paring knife eas¬ily slides into the center. Using a slotted spoon, remove the pears to a large plate. When you’re ready to serve, stir the salt into the caramel sauce. 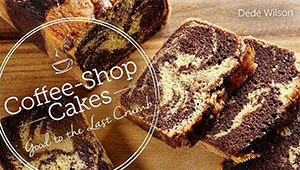 Set the meringue base on a serving platter or tray and dollop with the mas¬carpone. With your creative juices flowing, layer on the pears, pour on the caramel, drizzle with the chocolate, and sprinkle with the wal¬nuts. Cut your masterpiece into pieces and serve.